With that, we’ll turn it over to Denise. Against the backdrop of Pre-Revolution Paris, immortal Christian Du Mauré falls in love with a young, aristocrat, Josette Delacore, whom he meets one night strolling along the Pont Neuf with her lover, another vampire named Gaétan. Unable to resist one another, Josette runs into Christian’s arms and so begins their three year love affair that culminates on a hot July night in 1790, as Paris burns and Christian flees, leaving Josette to her fate. Centuries later, settled among his ancient books and antiques in Manhattan, living steps away from Central Park, Christian still pines for Josette, the woman he realizes will love forever. In these moments before the approaching dawn, as the darkness envelopes me in its cold embrace, I think of you. As I drift into nothingness, I can feel your arms around me and I wonder if we will ever meet again. Will you ever forgive me my youth, my arrogance and my self-imposed morality that cost me you? I was so young, yet all I knew is that I loved you deeply and so completely and that you haunt my thoughts and dreams to this day. Time is strange. It is constant and ceaseless. It flows like a rushing river from place to place, never lingering too long, picking us up and carrying us along as if we were leaves or twigs, floating on the waters’ surface. Time moves forward and yet we can only make sense of it by looking back – a curse for us immortals who have centuries to reflect back on our mistakes. I still ask myself, how could I have let you go? I thought that interfering in your life was not my role and I had no place in the mortal world, but I was wrong, Jo. I should have taken you with me that night. As Paris burned, and my heart ached for you, I chose to say goodbye and I have tried to never look back, to not allow myself to regret leaving you behind, but in this I have failed miserably. You haunt my nights Josette as you will forever. I find myself here now, in 21st century New York City, a place you could never imagine; living with Michel. Does he dream of you as I do? Is his soul torn in two as mine has been over leaving you behind? He loved you Josette, yet even now it is hard to be angry with you. It’s strange, but I feel you here with me, in me. I do know that my love for you has carried me through time, from that spring evening we met until this moment. Your love is what has sustained me Jo, not the blood I need to survive, but your beautiful smile, warm laughter, dark eyes and the memories of us. Mostly the memories of us. I am still in awe over your power to captivate me and in this regard, time stands still, my love remains constant and as I fall into darkness I still feel you here with me. Denise K. Rago is a paranormal romance author whose first novel, Immortal Obsession, was published in September 2010. You can reach Denise on her website, where you can also read an excerpt of her book – part love story, thriller, vampire romance and paranormal romp that takes place in Revolution-era Paris and modern-day New York. 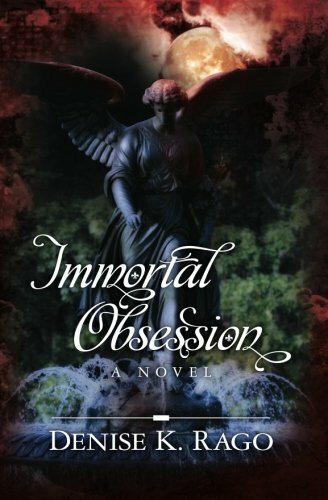 Denise has kindly offered one Vampire Book Club reader a signed copy of her novel Immortal Obsession. Leave a meaningful comment on this post by Feb. 21, 2011, and we’ll pick one person at random to win a copy of the book. Make sure you include a valid email address, so we can contact you. THIS GIVEAWAY IS NOW CLOSED. CONGRATS TO OUR WINNER, VIKI, AND THANKS TO ALL WHO ENTERED! This is an amazing giveaway I really want to read this book! Thank you so much for the introduction! this really got me in the mood for valentines day. I feel for Christian. I would love to read his story! Well I think I would have to say if the book is as good as this letter was I won’t be able to put it down. This seems like it could be epic, reading the letter made me tear up. I have read a lot of vampire based books and they seem very similar. Whereas this seems like it could have a new and refreshing take on the whole vampire genre. Even if I don’t win this book I think its one I will make a point to read. What a beautiful letter. This sounds like an intriguing read. I am definitely putting it on my TBR. That letter made me weepy. What a beautiful thing to write to a lost love. Christian sounds heartbroken. That cover is gorgeous too. OMG, I so wanted to read this. That letter is so beautiful. Breaks my heart. I definitely need to read this book. After I read the letter my heart aches for him. Now you have me intrigued to find out what happened and does he meet up with Josette centeries later. Need to know! LOL Definitely adding it to my TBR list. It does sound like the perfect vampire Valentine story. Great letter. This cover is really eye catching. The premise sounds great and refreshing. Thank you for such wonderful words. Yes, Christian is heartbroken and still pines away for Josette, despite centuries passing. Ah, true love. Sigh…very nice 🙂 I need to know the rest..lol Please count me in this contest. What a beautiful yet heartbraking letter. I would love to read this. Thank you for the opportunity. That was a beautiful letter!! I am absolutely dying to get my hands on that book now. How beautiful, if the book is half as wonderful it will be AMAZING!!! It is been added to my ever growing TBR list. Blogs like this are fantastic for getting the word out about great books such as this! Such a nice, but heartbreaking letter. :'( I would totally read this see what happens!!! Because i do so much with the highschool. By reading the books and then donating them to the highschool. It would be nice to read an adult noval. Thank you for the chance. Great article! This sounds wonderful book. I love vampire novels placed in historical settings. I agree with the other posters, the letter is beautiful. Is this book going to make me cry??? I loved the letter. I can’t wait to read the book! I love that letter – so beautiful. I want to read this! Very nice letter. Thanks for sharing. I am looking forward to reading your book. I would so love a copy of this book! Thanks for this giveaway!! I am a SUCKER for tortured souls and vampyre love stories! Probly cuz my own life/love life is sadly lacking..lolz.. Regardless if I win or not this is going on my reading list. NOW. lolz. I get sooo many gr8 reads I am having a prob figuring out what to read and in what order. Reading literally saves my life, I am prone to serious depression and meds dont always work for me so reading helps me. It makes me happy and keeps me from dwelling on the other things in my life. Without my books..I shudder to think.. I love authors for sharing their passion and talent with us.. So what happens? Is she still alive somehow? Do they find each other again? I’d love to read this! Her name is Josette Delacore and she was young, beautiful and very mortal. As I work on book two in this series, I ask myself the same question. How would Christian react if he found out she had never died in Paris but was still alive? Would he be happy, feel deceived? I am not sure but I am writing away and hopefully by the end of 2011 we all will have more answers. Thank you everyone for these wonderful comments. It makes writing so worthwhile when readers respond like this. This sounds like a great read, looking forward to it. I have just discovered this website so working my way through the recommendations list. So far this week I read 2 of your group read books. Love it!!! Awww…what a lovely letter. I got all teary eyed. I’m really wanting to read this now! Why have I never heard of this book before? OMG! It sounds amazing and I absolutely MUST have it!! I realize that the contest for winning a copy of my novel ends today. I need to thank Chelsea for allowing me to introduce you to Christian Du Maure and the world of Immortal Obsession. Websites such as this bring so many of us together: readers, writers, reviewers and it is truly amazing so please continue to visit Vampire Book Club and support all of her hard work. It’s the love of books, characters and good stories that brings us all here. Thank you Chelsea and everyone who dropped in. That was a very sad letter. Beautiful also. I’ve put the book on my to buy list. I love these love letters, they give such insite into the characters ,I would love to win a copy of this book, but if not it will definitely be going in my “to be read” pile.